Ants, spiders, and frogs, oh my! The long-running Earth Defense Force series is well-loved (by those in the know) for its low-budget sci-fi thrills and amazingly addictive co-op gameplay. Heck, I even played an Xbox 360 entry with this site's founder as an initiation way back in 2011. Though the series has since become exclusive to PlayStation and PC, it continues to deliver unique and addictive cooperative action. The latest PlayStation 4 installment, Earth Defense Force 5, lives up to the legacy. Whereas the last mainline game, Earth Defense Force 4.1, and its (regrettably non co-op) shmup spin-off, Wing Diver The Shooter, built off the story of EDF 2017, Earth Defense Force 5 starts fresh by rebooting everything. EDF 2017 was a reboot of the very first PlayStation 2 EDF game, so there is precedent. The new game mixes things up by casting players as civilians who get drafted during the alien army’s initial attack on the Earth. As such, the player characters begin in endearingly goofy makeshift outfits before transitioning into traditional sleek sci-fi garb in later missions. The alien invaders are now led by towering humanoid frogs and their superiors, the cosmonauts. These aggressive foes take the place of the traditional Hector robots, but they still lead the armies of giant ants, spiders, UFOs, pillbugs (back from EDF2! ), and other unfriendlies that series fans love to kill. As always, the story is primarily told through deliberately hammy radio chatter and news announcements. I don’t dig the voice acting quite as much as 2017 and 4.1’s, but the campy humor still delivers amid the drama and chaos. 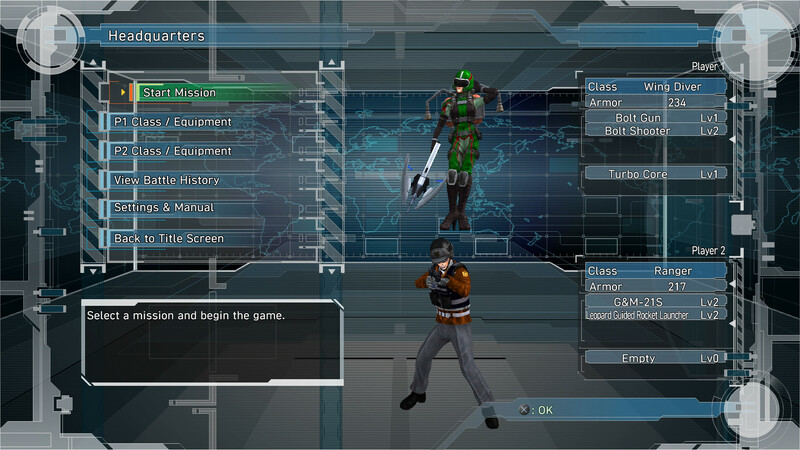 EDF 5 plays things safe with its character selection, offering the same four classes from the last few games. Rangers are the traditional all-around soldier class, Wing Divers are the fast-flying female class (my personal favorite), Air Raiders function as support, and Fencers tank things up. The huge variety between classes provides ample player freedom and helps keep co-op fresh, as always. Each class has various tweaks in this installment that make them more fun to play. The ranger can now perform a roadie run (with terrible camera angle) by clicking in the left stick, for instance. And the air raider’s aerial bombardments have been seriously upgraded, decreasing their reliance on summoning vehicles. Speaking of vehicles, wing divers can finally ride in vehicles summoned by other classes now. But with the new equippable cores that allow customization of her flight and energy abilities, lumbering around in a mech might feel constricting. A huge part of EDF’s core addictiveness comes from the items dropped by enemies – not the white health boxes that provide instant health refills, but the permanent benefits of red armor and green weapon boxes. Armor adds to each class’s overall health, whereas weapon boxes provide random weapon unlocks for the various classes. The certainty of building up your health and the uncertainty of which weapons you’ll get have always added plenty of incentive for replay in these games. Both armor and weapons have been reworked and improved in EDF 5. On four of the five selectable difficulty levels, armor pickups now increase the health of all classes, not just the one who picked them up. Weapons work the same way, but they also confer another new advantage. In previous games, finding a duplicate weapon offered no benefit – the goal was just to collect them all. But now, weapon duplicates sometimes increase a random stat on the original weapon. So old weapons improve as you progress through the game, keeping a much larger portion of your arsenal viable in later levels. 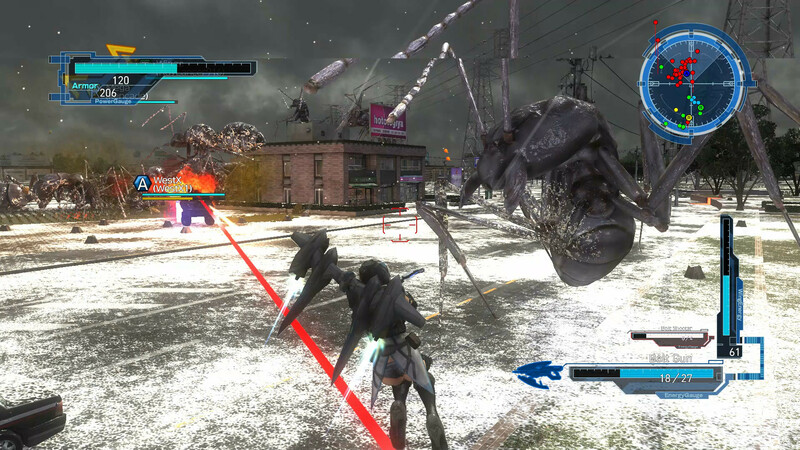 The cooperative experience of EDF 5 remains nearly unchanged from 4.1, with both 2-player split-screen co-op and 4-player online co-op available. Sadly, the combo co-op of EDF 2025 (ommited in 4.1) has not returned. In split-screen, the second player functions as a guest, adding to the first player’s progression. That means no Trophies or progression for the second player, unfortunately. 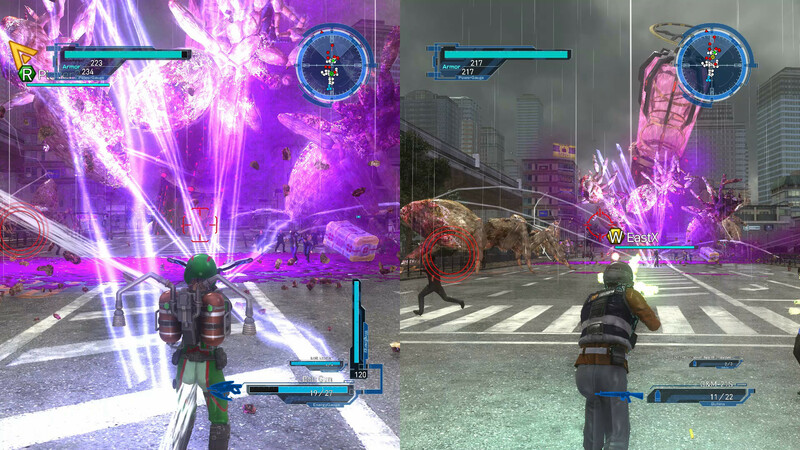 But many EDF players still find split-screen very useful for unlocking the primary player’s trophies more quickly. Also, be warned that (for the first time in the series) offline story mode starts out with an extremely tedious tutorial mission. You might want to get it out of the way before inviting a friend to share your screen. Naturally, 4-player online co-op provides a superior experience since more players equals more chaos and fun. Players can create, browse, and search for rooms with a wide (maybe even impractical) variety of parameters. Inviting players to a room remains a bit clunky – you must do so via the d-pad’s in-game chat menu. The only problem with online multiplayer is developer Sandlot’s stubborn refusal to allow drop-in co-op. Players can join a game in progress, but they’re forced to sit in the lobby. They can’t even spectate, annoyingly. Blasting away at huge numbers of bugs and monsters is always a blast with friends. One doesn’t even need a microphone for the proper co-op experience; EDF 5 provides some of the best voiceless communication options in a console game. Swiping on the DualShock 4’s touchpad provides quick access to eight chat shortcuts. 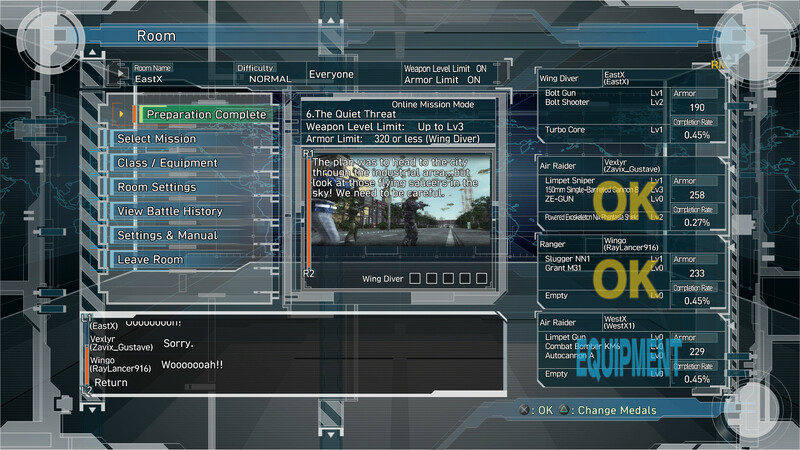 On top of that, the d-pad’s chat menu allows scores of different messages to be directed to the group or specific players. You can even type messages with the console’s software keyboard or a physical keyboard. The only area in which EDF 5 might disappoint is the graphics. True, this series has always featured low budget visuals. Sandlot chooses to prioritize gameplay over spectacle, and most EDF fans wouldn’t have it any other way. In my experience, EDF 5 runs virtually the same as EDF 4.1. Enemies show visual damage now (which looks rather unpolished) and even break apart into pieces, so it’s not like the engine hasn’t been upgraded. But on PlayStation 4 Pro, at least, I had hoped for more noticeable enhancements. Still, the new rain and snow effects are welcome additions. 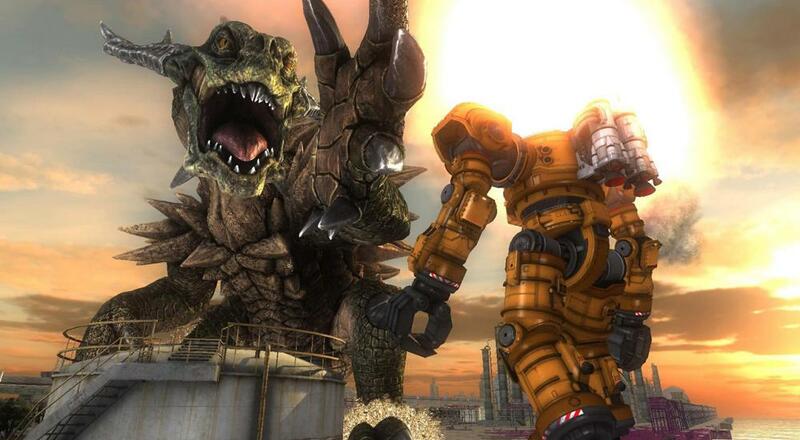 Earth Defense Force 5 is another great entry in this cult-classic series. Sandlot and publisher D3 Publisher have created a sequel that improves on the last game in significant ways, even if a few issues persist. With four distinct classes, hundreds of weapons to discover and upgrade, 110 new levels, and five difficulties (two of which must be unlocked this time), EDF 5 is a game that will occupy co-op fans and completionists for months to come. Don’t hesitate to grab a partner or three and get ready to deploy! 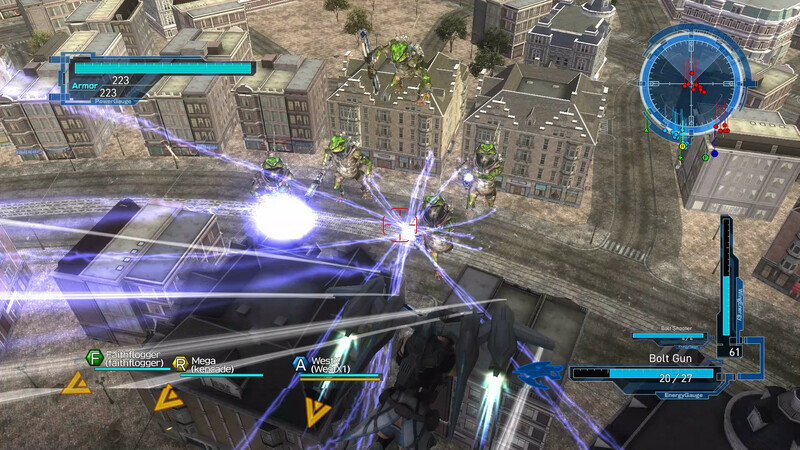 A review code for the Co-Optimus Co-Op Review of Earth Defense Force 5 was provided by the publisher. Page created in 1.4675 seconds.